Stocks broke sharply in NY, largely wiping out Wednesday's gains; the Dow industrial and utility averages hit new bear market lows; bonds also fell but selling was better absorbed; commodities opened strongly but later followed securities markets lower. The London stock market was "strong, due to decline in sterling" while bonds were irregular; Paris was "independently firm." German stock markets will remain closed until next week; main reason for closure is "nervousness in banking circles" though official reason given is "uneasiness about the position of mark exchange" as sterling and other currencies become cheaper; German coal exporters are reportedly suffering from British competition. The Fed. Reserve reported gold continued to be "earmarked" for the account of foreign central banks (in effect exporting it from the US); $64M was earmarked up to 3PM on Thursday, bringing the total in the past week to $185M. Foreign and local bill selling reached an "extraordinarily large" total of about $100M on Thursday; bill dealers "advanced their rates sharply in a spell of nervousness;" open market rates rose 1/4% on all maturities but the Fed Reserve maintained its buying rates for bills, and left its rediscount rate at 1 1/2%; this was seen as "a virtual invitation to banks and dealers" to sell bills to it. It's believed the Fed. would welcome a large increase in bill holdings and discounts, in pursuance of its policy of "making money rates extremely easy and increasing the volume of both Fed. Reserve and general bank credit outstanding." [Note: What would we do without noted economists? Dept.] Sir Josiah Stamp, noted economist, says influence of a number of countries leaving the gold standard would be to release a large amount of the pressure to possess gold in order to back currency, automatically making it less valuable; predicts "this may stimulate a rise in the price levels" of countries remaining on gold standards, "with strange consequences in the exchange rates." Bank of Montreal notes that England's action has “deranged sterling exchange, but there is no reason to anticipate serious consequences to international trade, which in the past has flowed freely in like circumstance.” Regarding Canada, notes August external trade $97.2M, down 35% from 1930, continuing a steady two-year slide accounted for in most commodities by both lower prices and volumes. Silver has moved higher since British abandonment of the gold standard (from 27 1/2 cents last week to 29 1/4); speculative buying has increased; "the market is generally unsettled and further fluctuations are probable." The silver market "will be watched with growing interest in the coming weeks"; past weakness in silver has been a disturbing influence on the commodity situation, and some interests argue improvement in silver would be encouraging. Some believe India may return to a silver standard, which might result in a sharp rise. It's reported "well posted interests" have been buying mid-1932 silver futures. Silver prices in Mexico have improved slightly for several days, though the increase isn't attributed to the British situation. The peso rose slightly; bankers "attributed the fluctuation to superficial reasons and misinformation concerning the true character of the suspension of the gold standard." Washington officials indicated British proposal for international currency conference would be accepted. Swedish Fin. Min. denies govt. has discussed suspending the gold standard; says spending cuts needed but "no reason for pessimism regarding the budget position ... foreign reports that Sweden's finances are in a precarious condition are entirely unfounded"; govt. is contemplating measures needed to restore trade balance. Bank of Sweden raised discount rate to 6% from 5%. Cuban Treasury Sec. says Cuba will pay all external debts even if sacrifices are needed; can't understand drastic decline in Cuba Public Works bonds, which are trading at 38 in spite of guarantee backed by public works taxes. Italy's trade deficit seen benefitting from depreciation in sterling since bulk of Italian trade is transacted in sterling. Bank of Italy reports 60% circulation coverage as of Sept. 10, of which 37% is gold and the rest gold-standard currencies. European financial developments this summer "have caused the Chicago business community willy-nilly to take a much greater interest in what is going on across the Atlantic." The strong effect of European news on business in the "economic vortex of the North American continent" has "literally forced many business men to follow news from abroad closely, in order to protect interests which at first might seem purely domestic." AFL pres. W. Green, says he's not sure if Asst. Commerce Sec. J. Klein was quoted accurately as saying "there will be hell to pay throughout the US in the event of a general wage reduction," but that "it is my honest opinion, arrived at after deliberate and calm consideration, ... that it ought to be a logical outcome of the wage cutting policies pursued by the highly protected employing corporations of the nation." An "insurgent" group of miners has called a strike against the Glen Alden Coal Co.; J. Boylan of the United Mine Workers said the strike was unauthorized and a "complete failure" with only a handful walking out; W. Inglis, company pres., said about 5,000 of the company's 25,000 workers were out; T. Malone, "insurgent leader," said about 10,000 were on strike. Officials of the Amer. Federation of Full-Fashioned Hosiery Workers said they were opposed to a strike called by their local in Paterson, NJ. The union's agreement last Saturday to 30%-45% wage cuts has been met by agitation for a general strike at local unions in NJ, NY and New England, but national union officials said they stood behind the agreement. US govt. denies pleas of labor organizations to close bridge at El Paso in order to bar Mexican laborers. Reports from Al Capone's headquarters in Chicago "indicate that he has sent out a wage cut order, similar to those of industrial firms all over the country." 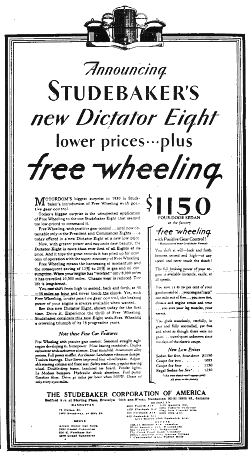 The amount of beer and liquor sold at saloons is reportedly down about a third from the days of prosperity, and gambling houses are also bringing in substantially less. Rather philosophical editorial calling for more US involvement in world affairs to prevent future war. The world is in the grip of two opposing forces. One, "the economic interdependence of the nations, has drawn us together in relations of the most intimate kind. The other, 'nationalism,' in an exaggerated degree, exercises a centrifugal force, threatening at all times to force us apart." A counter-force to nationalism is needed, but "all experience teaches us ... the mere dread of the material penalties that accompany war" is insufficient; "after a reasonably long armistice men quickly forget in prosperity the lessons that were so clear when taught by the now-forgotten war and the pride that prosperity has engendered readily grasps at new illusions." Instead a "spiritual" influence is needed; the first requirement is the "clear realization that we in the US can not live to ourselves alone" and must "recognize our share of the responsibilities of the family of nations and understand that upon discharge by us of that share depends our own safety and well-being." The US Administration is reportedly "very keen" to have Premier Laval of France visit; US govt. observers at the recent Paris-London conferences "formed a very high opinion" of Laval, believing "his views on Europe are broad and liberal" and his leadership of the French govt. "a hopeful augury for the future." Officials refuse to comment on what might be discussed during the visit, "but point out that the sky is the limit." The French Cabinet has decided to accept the US invitation to Premier Laval to visit; Hoover-Laval talks in Washington are seen laying the groundwork for the world arms conference at Geneva in February, as the Hoover-MacDonald talks did for the successful London Naval Conference in 1930. Laval, the son of a butcher, also expressed hopes of visiting other parts of the US, commenting "The Champs Elysees isn't France, and I suppose New York isn't America. I represent the abbatoirs in the Paris Parliament and so I would be happy to visit Chicago if possible." Premier Laval will reportedly discuss with German officials "a scientific plan of emigration to cure Europe's unemployment problem." Noting that before the war Europe exported 2M-3M emigrants annually but since the war the US, Canada, Australia and Asia have closed their doors, the plan will propose studying "diverting surplus population to the African colonies and South America under sound economic conditions." The USDA says direct reports from Russia are now arriving of trouble with wheat crops, confirming information the USDA obtained previously and reversing the optimism of earlier Russian reports. The Russian press has complained of work falling behind, blaming inefficient handling of machinery and "general slackening in the efforts of workers"; the importance of timely seeding of fall grains is stressed, noting that due to late seeding last year, many areas in the Ukraine experienced 20%-40% winter kill. Buyers are noting a lack of surplus spring wheat from this year's crop. [Note: There are no free-marketers in foxholes dept.] C. Abbott, dir. of the Amer. Inst. of Steel Construction, called on Pres. Hoover to discuss steel industry problems and endorsed the plan presented by GE pres. Swope for control of industrial production, particularly to limit output of basic commodities to consumption; says suspension of antitrust law in current emergency would "prevent waste and conserve the profits that are essential to ensure employment." Editorial praising B. & O. RR pres. Willard's call to railroad managers and regulators "to come together in a new spirit of cooperation." Both rails and the public would "benefit immeasurably" if this were done rather than "pursuing individual theories, preferences and interests to the limit." Customers have been "too selfishly intent" on beating rates down by any means, while some rails have "been too intent on seeking company advantage" to help the ICC protect the industry as a whole. While an emergency rate increase is needed for the rails to carry on now, a better relation with regulators would be more important in the long run. W. Bennett, Continental Coal gen. counsel, presented new plan for stabilizing the coal industry similar to that recommended by the Administration to the oil-producing states as a solution for overproduction. The governors of several coal-producing states will appoint a committee of coal operators to study various plans; the committees will then report back to the governors. Pres. Hoover reported pleased. Sen. Wheeler of Montana predicts nomination of Gov. Roosevelt for President in 1932. A statement by former Sen. Reed that he would consider it a "compliment" for Missouri Democrats to nominate him again will not help Roosevelt's candidacy; while Reed isn't expected to pursue the nomination country-wide as he did in 1928, he's not to be counted out at this stage; there's some doubt whether Roosevelt workers will even go into Missouri in view of Reed's statement. The American Legion convention cast two notable votes; a resolution to petition Congress to loan veterans the full value of their bonus certificates was defeated by 902 to 507 in a calm vote, while a resolution opposing Prohibition passed 1,008 to 394 amid "wild disorder." Wets were encouraged by the second resolution, which asserted Prohibition had "created a condition endangering respect for the law and the security of American institutions" and called on Congress to resubmit the matter to the states. Wets agreed that the "first task necessary is to make inroads into the Congressional dry majorities. Despite prevailing Washington opinion to the contrary, they are not without hope that this can be done at the next session." Considering its past ability to "get pretty much what it wanted from Congress," the Legion's stand "will have a great influence" although it will meet more determined opposition in dry organizations than it did in its past work for veterans' benefits. Pres. Hoover was heartened by the Legion's vote on the veteran's bonus, but had no comment on the Prohibition matter. Agriculture Sec. Hyde announced he intends to investigate the economic possibilities of beer for farm relief, though he emphasized he wasn't instructed to make the study by Pres. Hoover. New Navy dirigible the Akron, world's largest airship, successfully completes first test flight lasting 3 hours 47 minutes. NY fall moving season likely to be quietest in several years; furniture storage increasing, with indications many are moving into smaller homes. NYU's Graduate School of Business Administration opened this week with a graduate registration larger than last year. NY Telephone uses a special operator just to give callers the correct time. The phone number for the service is Meridian 7-1212; callers hear the operator giving an updated time every 15 seconds. The peak number of calls comes in the 4 PM hour, averaging 3,000 callers; next busiest is 11 AM - noon; the rest of the day averages about 1,000/hour, and the total falls off rapidly after 6 PM. "Because of the monotony of the work, each operator is on duty only one hour at a time." It takes 480 janitors to keep the Empire State Building in order, and that's without a single hand mop or broom in sight; all cleaning is done by machines. Although 50,000 people "trudge in and out of the building daily, they track in only one barrel of dirt." Market wrap: Stocks reversed Wednesday's sharp rally. The market opened under selling pressure, and, after it was unable to absorb the supply, "liquidation, which halted on Tuesday, was resumed in large volume"; many stop-loss orders were uncovered by the end of the first hour. Declines were sizable across the list, but were particularly sharp for stocks in which bears had been punished in the previous sessions, including Union Pacific, Western Union and Auburn. Selling "was most persistent throughout the list"; the market could muster only a feeble rally off the bottom. Bonds showed early strength in some groups but later turned mostly lower; US govts. very weak with many new yearly lows; foreign list mixed with rally in S. American issues; rail bonds weak while utility issues showed “characteristic resistance.” Cotton rose early, influenced by "soaring prices" in foreign markets affected by sterling, but later fell off to close substantially lower. Wheat also strong early but pressured as the sharp reaction in securities broke out and ended fractionally lower. Copper remained at record low of 7 cents/pound but with more buying interest; large producers have withdrawn from the market. Silver fell 3/8 cent to 29 1/8, futures trading heavy. Dow industrial average closed at a new bear market low; there were no new yearly highs and 102 new lows. Dow average of 40 corp. bonds closed at 89.25, down 0.60 but above the year's low of 88.56. Conservative observers pointed to the market action as justifying their attitude in keeping clients away from the long side; believe liquidation likely to continue. Prominent bears reestablished positions they abandoned Monday and Tuesday under NYSE pressure; while the NYSE again allowed short selling on Wednesday, the bears craftily waited to see how far the rally would carry, and resumed their "hammering tactics" when it became apparent it was exhausted; targets included Westinghouse, American Can and J.I. Case. While recent wage cuts should be positive in the long run, bears contended "the downward adjustment of values had not been completed," noting continued weakness in steel production, rail freight loadings, and electricity usage. With no signs of improved business, "they felt that the market was open to further tests of its ability to hold above the recent lows"; some "insisted that business still had many trying periods to pass through." US Steel drew heavy interest, at one time falling 8 1/4 points to 75, close to its bear market low. Union Carbide and du Pont hit new bear market lows. High-priced rails were weak, reversing Tuesday's impressive gains. Public utilities experienced heavy selling; North American Co. was heavily targeted by short sellers although "it ranks as one of the strongest utility holding organizations ... and is noted for its conservative accounting methods." Technical position of the stock market was weakened by Wednesday's "violent gains" as short interest had been substantially reduced. The market was also unsettled by renewed weakness in bonds, particularly in rails and foreign issues. Heavy short covering had developed in the rails at times earlier in the week, leading to "spectacular gains which were frowned upon by many of the conservatives." Stock investors are giving the bond market "more significance ... than at any time in the past"; "several of the leading professionals will base stock market operations on the action of bonds"; further bond weakness may therefore delay operations in the stock market by "interests who have been credited frequently in the past with directing upward movements." S. American bonds have generally declined to very low levels; even after the rally Wednesday, few closed at a yield below 10% and many $1,000 par issues are selling below $250. This, of course, reflects uncertainty due to defaults that have already occurred in Chile, Bolivia and Peru, along with the announcement Brazil will suspend interest payments. Commentary questioning absence of investment trust [similar to mutual fund] buying of foreign bonds that are now available at huge discounts; this is said to be just the type of profit opportunity the trusts were supposed to be ready for. Some trusts may reply they buy only domestic stocks, but there's no such restriction in their charters; the real explanation is that investment trusts are in general so heavily invested that they've been able to do little buying at current low prices. NY City borrowed short-term funds at a record low rate of 1 3/8% for 3 months; the city has been able to attract funds at exceptionally low rates over the past year or more; a year ago its prevailing rate was about 2%. The city has also done very well at selling longer-term loans, most recently selling a $50M issue of 4-year notes at 2.99% in May. Brokers report greater public participation early in the week; many customers who had sold stocks some time ago and stayed on the sidelines reentered the market. Buyers used "great care and discrimination," concentrating on stocks that were heavily liquidated and that had suffered from forced foreign selling. B. Block of Benjamin Block & Co. believes "the American market is again a stable one"; its remarkable "ability ... to absorb a flood of foreign offerings and mount to higher levels" after Britain's abandonment of the gold standard "indicates that a definite change for the better has occurred both at home and abroad" and that "stocks of companies that have been able to earn money during these times of depression can again be bought with safety." Of course, buying should be "on a conservative basis and a due amount of patience exercised"; however, the US is strong in natural resources, manufacturing and financially, putting it "in a position to benefit as probably no other country will during the next few years." “Insatiable demand” for AT&T stock continues, with about 5,000 new shareholders added per month; over 600,000 stockholders are now listed on AT&T's books, not including over 200,000 Bell System workers covered under the employee stock plan. Average number of shares per holder is 31. While AT&T will probably not cover the $2.25 quarterly dividend in the seasonally weak Q3, first half earnings were $4.89/share (vs. $5.72 in 1930), and business is expected to improve in Q4; therefore, the $2.25 dividend will "undoubtedly" be maintained for the rest of 1931. Treasury Secretary Mellon is likely to announce with a month whether the Administration will recommend a tax increase; Treasury has been "looking into various revenue sources" for the past few months. Money in circulation Sept. 23 was up $77M to $5.164B, total Reserve Bank credit outstanding up $36M to $1.315B. Member banks in NY City report brokers' loans down $64M to new record low of $1.207B; loans on securities to non-brokers down $8M to $1.720B. Dow average of 8 iron and steel products held at $44.25 vs. the 1931 range of $43.58 - $44.56. Scrap markets continued to feature little interest by steel producers in purchasing for fall, though some quarters expect steel activity may increase as a result of the recent wage cuts. Gen. Wolters, commanding the militia in the East Texas oil field, reports daily production in the area declined to 363,423 barrels vs. a peak of 436,000 after the new Railroad Commission order limiting production to 185 barrels/day per well. Texas Gov. Sterling sent a telegram criticizing the "great amount of unnecessary drilling" being done in East Texas. While Oklahoma Gov. Murray has said oil fields there won't be reopened yet and he will still insist on a price of $1/barrel, conferences between state officials and oil operators are increasing and reopening is believed in sight. Oil operators cite agreement by the Public Service Commissioners of Texas, Oklahoma, and Kansas to allocate allowable production among the states "to keep the national total well below demand as a means of stabilizing the market"; Oklahoma would be allowed 546,000 barrels of daily production, Texas 902,000 and Kansas 110,000. S. Carolina Gov. Blackwood signed a bill prohibiting planting of cotton in S. Carolina in 1932, provided 3/4 of the South's cotton acreage is similarly restricted. Postmaster Gen. Brown says air mail deficit is $17M; estimates 1M passengers will be carried by air transport lines this year. The Colombian Senate passed a law granting the President extraordinary powers for one year to deal with economic problems; powers include ability to restrict imports, either by raising duties or enforcing an embargo. Merchants Savings & Trust of Pittsburgh closed; deposits $1.0M. Bankers Trust of Philadelphia, closed Dec. 1930, to be liquidated by order of Pennsylvania Sec. of Banking; will make preliminary distribution of 25% to depositors "as soon as possible after legal requirements are completed." Depositors of the Cheasapeake Bank of Baltimore, closed Dec. 1930, may receive some money due them in October. The Baltimore Stock Exchange, passed a resolution fixing closing prices Tuesday as the minimum below which bids would not be accepted until further notice. Procter & Gamble pres. R. Duepree says co. "has adhered 100% to its plan of guaranteeing year-around employment to its factory employes throughout the US and Canada, and will continue to do so"; calls the plan "one of the most productive moves our company has ever made." Even in hard times, "the epicure is one purchaser who refuses to stomach anything but the best"; total Canadian shipments of live lobsters rose to about 12.5M pounds in 1930 vs. 11M in 1929 and 9.8M in 1928. Companies reporting decent earnings: City Ice & Fuel. The Breadwinner, a new comedy by W. Somerset Maugham. 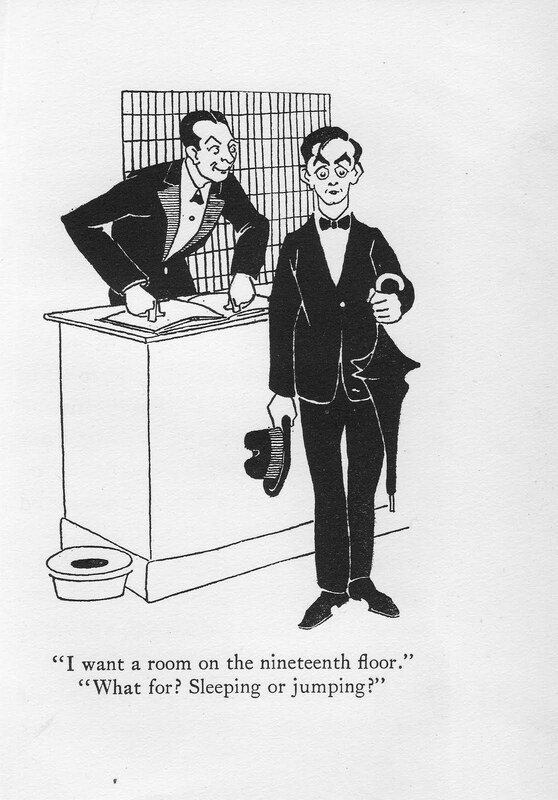 The author's revamping of Moon and Sixpence for the stage is generally unfortunate, though "not without its smiles." A husband repudiates his comfortable home and family, but, unlike in Moon and Sixpence in which there was at least "an illusion of positive purpose" as the protagonist felt he couldn't fulfill his artistic ambitions at home, in the play the reason for leaving seems to be simple boredom as "he has come to the conclusion that he does not want to do anything at all." "Inspector - Got away, has he? Did you guard all the exits? Country Constable - Yes, but we think he must have left by one of the entrances." Little Johnnie - I ain't gwine thar. Teacher - Listen carefully, Johnnie. I am not going there; he is not going there; we are not going there; you are not going there; they are not going there; thou art not going there. Do you get the idea? Student - Yessur. Ain't nobody gwine nowhar. A DOLLAR FOR DOLE - OR AN HOUR OF WORK? Which do you prefer to give? Which do you think Labor would prefer to have? ... Why not put the unemployed dollar to work? It will, in turn, put men to work ... I do not counsel you to buy a Packard, or any other car, before you buy anything else. Ours is not that selfish attitude. I do believe that the motor car dollar will go more places, more quickly, and affect more people for quick relief than any other dollar and that it can well become the “self starter for better business and greater prosperity. 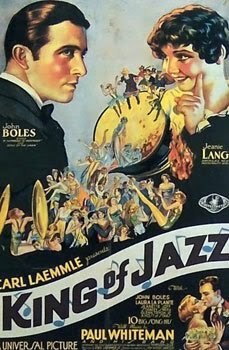 An interesting ad about Chicago - I think this one could be subtitled “never mind about that whole Al Capone thing.” The ad is quite striking visually, though this reproduction doesn't do it full justice. No word on whether the plane does a rooftop airmail delivery ... this building is still there, by the way, close to the main NY Public Library branch on 42nd Street. Markets rallied powerfully worldwide, making their best showing in many months. The London Stock Exchange reopened after a two-day shutdown while the NYSE and the Curb Exchange rescinded their ban on short selling. The NY and London Stock Exchanges led the worldwide rally; major issues opened strongly, moved up sharply through the day, and closed near their highs. Stock markets in Paris, Milan and Amsterdam also gained, although the Berlin exchange will stay closed this week and the Tokyo Exchange reopened but was quickly closed again after a break in prices. Kreuger & Toll bucked the general trend, closing down sharply in Paris trading. Bonds and commodities were broadly higher. Sterling settled into a narrow range between $4.08 and $4.145, closing at $4.10 [note: vs. $4.85 the previous week]. However, “business under the new regime is purely tentative” and the volume of currency transactions “has been kept deliberately within the narrowest limits, with banks, both British and foreign, fully respecting the Treasury's instructions, confidential and otherwise.” Canadian dollars rallied to a 6 1/2% discount vs. US dollars from a low of 9%; Italian lire and Swedish kroner also rallied; francs continued above the gold export point from NY; silver currencies rose; Argentine pesos fell sharply. Bank of England Gov. Montagu Norman seen likely to leave office when his term expires, to be succeeded by Sir Josiah Stamp. It's reported that “differences of opinion over abandonment of the gold standard have arisen,” though rumors that Norman would resign shortly were denied. Stanley Baldwin, speaking for the govt., told questioners in the House of Commons the govt. expected no immediate rise in retail prices. Despite govt. insistence that leaving the gold standard isn't that serious since the budget has been balanced, this balance may now be endangered by uncertain prices and the greater weight of debt owed in dollars and francs. On the other hand, improved business may increase tax revenue and decrease spending for the unemployed. With “the attention of the whole world” concentrated on British developments, the govt. is expected to make every effort to maintain the budget balance. British Conservative followers of Neville Chamberlain reportedly plan to dissolve Parliament Oct. 7 or 8; determined that general election be fought under leadership of PM MacDonald and Stanley Baldwin. British importers in Brazil are reportedly underquoting US interests due to the decline in sterling. Leading retailers and banks in Buffalo, NY ended their past custom of accepting Canadian dollars. The recent drastic decline in foreign dollar bonds has produced some eye-opening yields; at the lows this week few foreign govt. bonds were selling to yield less than 6%, and many issues are selling at prices below their calculated yield to maturity. A striking example of the recent buyer's market in these foreign bonds is seen in Norway dollar bonds; these now yield about 6.9% on average vs. 5.24% in June, in spite of Norway's "unblemished credit record, and ability to survive currency troubles in the past." The US Steel wage cut drew mixed reviews. AFL pres. W. Green issued a strong condemnation, calling it “morally wrong” and claiming “no greater blow ... has yet been struck against the forces which have been and are now serving to bring about a return of prosperity.” Reaction from the steel industry was generally positive, with many producers announcing their intention to follow suit. The White House released a statement saying Pres. Hoover's commitment to maintaining living standards was consistent and unaltered. However, the statement was again carefully parsed for signs of a change in the White House stand against wage cuts; it was considered highly significant that the statement referred only to living standards and not wages, since today's lower cost of living allows the same living standard at lower wages. It was also considered significant that the White House has shown a general disinclination to discuss wages for the past few months. Administration officials generally refused further comment, though Labor Sec. Doak said the Labor Dept. regretted the cuts. Opinion seemed divided on whether the US Steel wage cut would be followed by price cuts on steel products. A front-page commentary said "the decks have been cleared for a recovery in the steel industry" since the impending prospect of wage cuts had "for a long time been a factor delaying placing" of orders. However, the recovery apparently will be due to "greater effort to attract tonnage and increase operations" rather than price cuts; "it is the view among leaders steel prices should be maintained ... it has been the experience in the industry that orders are not obtained through the slashing of prices." On the other hand, an editorial said it was regrettable US Steel didn't provide more explanation of the cuts, but that "the wage reduction unquestionably means that the Steel Corporation is putting itself in a position to make whatever further price readjustment consumers may effectively demand as a condition of expanding their purchases ... at some level or another prices must prove a stimulant to consumption in this as in every other field." On the other other hand, an item in Broad Street Gossip said some believe the wage cuts will be used to lower prices, but steel makers don't plan on this, pointing out "consumers cannot be attracted ... regardless of quotations [prices], until they have prospects of new business." The steel industry's decision to finally make wage cuts was reportedly influenced by the disappointing failure of steel operations to show seasonal post-Labor Day gains; substantial improvement had been hoped for due to the very low rate of operations this year. Wall Street had anticipated US Steel's wage cut announcement for some time; in fact, many believed "the cut was delayed longer than justified by conditions." The Street's generally favorable reaction to the cuts reflected "the sentiment in business and industrial circles that such a program was essential to trade recovery. ... With living costs substantially lower, and the return on capital notably reduced, it was inevitable that the liquidation of labor would have to be undertaken." The Street is now turning its attention to possible wage cuts by the railroads and other industries. While it's admitted rail wage cuts might be difficult because of "various brotherhoods" [unions], it's believed that with conditions still showing little improvement rail executives will be able to convince govt. officials and labor leaders of the need to lower costs. The positive reaction to steel wage cuts is reducing nervousness over expected wage cuts in other industries. D. Willard, B.& O. RR pres., says rails may eventually be forced to make wage cuts, but believes 15% rate increase would be a better remedy; notes current procedure for rail wage cuts could involve management-labor conferences, mediation, and arbitration, which could stretch over several months. GM's 10%-20% salary cuts were their first cut in employee compensation during the depression; GM had already made large cost savings through improved efficiency, producing a relatively strong earnings perfomance in spite of lower sales. The cuts affect only salaried employees (about a quarter of GM's workforce); hourly wage rates remain unchanged. Corn Products Refining Co. seem likely to cut employee compensation for the first time by year-end; dividend cut also likely. Japanese forces finished taking control of the South Manchuria Railroad Zone and of Chinese railheads in Manchuria; Japanese casualties in the 5-day operation estimated at 200. League of Nations calls for peace between China and Japan; asks parley to arrange withdrawal of Japanese troops from occupied area. Tokyo's decision seen depending greatly on US attitude. Japan instructs representative an Nanking to accept proposal of Nanking govt. Finance Min. Soong for appointment of joint commission to investigate troubles between China and Japan. Editorial calling for disposing of the Farm Board's large wheat surplus by selling it to China, whose rice crop has been devastated by flood. While China has already taken 15M bushels of wheat on long-term credit, the Chinese Economic Society estimates it could easily use another 135M; "China must have wheat or rice or else starve." The "white elephant" of wheat stabilization is evidently dead; this is a golden opportunity to bury the corpse. While "China's credit is not of the highest," wheat sold there will at least not oversupply the usual markets, as recent sales by the Farm Board did. NY Gov. Roosevelt signed three bills inaugurating his $20M unemployment relief program for NY State. Relief will be administered by a three-member independent panel with broad powers. The program will be paid for through a 50% increase in the state income tax. NY City spending on unemployment relief estimated at $40M in fiscal year ending Oct. 31. About 34 states have officially said they will participate in the 1933 World's Fair in Chicago. Several large fair buildings have been completed or are under way, but about $25M of construction remains to be done. [Note: Sounds like my last checkup.] "An English surgeon has come out with the statement that Shakespeare's death 'resulted from complications of fever, typhus, typhoid paralysis, epilepsy, apoplexy, arterio-sclerosis, oversmoking, chronic alcoholism, gluttony, angina pectoris, Bright's disease, pulmonary congestion, and locomotor ataxia.'" Market wrap: Stocks staged a broad and vigorous advance. Buying was widespread at the open, with US Steel a leader; the advance picked up momentum as the morning progressed; rails were a strong spot. Stocks gained further at mid-day after news of gains in European markets. Considerable profit-taking in late afternoon caused some irregularity though the selling was generally well absorbed; however, US Steel suffered a good-sized setback from the day's high and Anaconda broke to a new bear market low. Bonds also staged a strong and wide rally. British 5 1/2s due 1937 opened at 99, up 7 from the previous session's record low, and later reached par; European issues joined the rally, with many showing sharp recoveries; Japanese issues also recovered lost ground. Rail issues experienced the widest and sharpest rally of the year, particularly in recently weak lower-grade issues. Public utility bonds were in strong demand. Trading in US govts. was inactive but prices remained steady to firm. Grains generally higher on dull trading. Cotton rose sharply in spite of good weather reports. Copper remained at record low of 7 cents/pound, though buying is reportedly better. Silver rose 7/8 cent to 29 1/2. Cocoa rose sharply the day after hitting record lows. For the first time in the past 5 sessions, and only the second time in the past 10, the Dow failed to close at a new bear market low. Market sentiment was improved, though conservative observers advised watching the market for another session "on the theory if new liquidation is to break out it will make its appearance shortly." Positive factors affecting sentiment included yesterday evening's announcement of 10% wage cuts in the steel industry, optimism over an early decision on the rail rate increase, firm performance of European markets, and the strong market performance after restrictions on short selling were lifted. The NYSE removed its restrictions on short selling; this was "looked upon as indicative of confidence on the part of the banking leaders that conditions were nearer normal again." Many observers were more optimistic on the immediate market outlook, though few were willing to buy "for more than a technical turn." Short covering was heavy at times after the removal of the short-selling ban; some bears had reportedly held their positions through the ban since they were unwilling to leave the market, but were now covering "with the idea of putting out short lines again when the rally appears to be reaching its culmination." Large drop in rail car loadings for the week of Sept. 12 (down 91,796 from prev. week to 667,750, and down 30.8% from 1930), while partly accounted for by Labor Day holiday, was "greater than seasonal ... and is a continued reflection of the lessened business activity in many lines." Rise in silver prices seen benefiting mining cos. whose ores have silver content, particularly copper miners. American Woolen and International Shoe are reportedly experiencing heavy demand and operating at high capacity. M. Sloan, NY Edison pres., predicted a repeat in the next two decades of the electric industry's remarkable growth in the past 18 years; while growth from new customers is slowing, a large potential for growth remains in new uses for electricity and increased usage by customers. An abundant supply of low-cost meat is predicted for next winter and spring. With wheat and corn at extremely low prices, many farmers are interested in buying thin livestock believing they can do better by using their grain as animal feed; drought conditions in the Northwest have also stimulated sales of "unfinished" livestock. Steel production for week ended Monday was about 29% vs. slightly over 30% the previous week, 28 1/2% two weeks ago, 60% in 1930, and 83% in 1929. Weekly steel reviews report steel demand has slipped back to the August level; demand in public construction is still promising, but automotive outlook, instead of showing expected improvement, has become "increasingly obscure." Rail inquiries are very weak, and may be delayed until the wage question is settled in that industry. However, the steel trade believes "abandonment of the gold standard in England and a reduction in steel wage rates here have helped to clear the atmosphere," and "prices are holding surprisingly well, though not subject to severe tests." Machine tool market "very uneven," with increases in some sections offset by "continued dullness elsewhere." The President's organization for unemployment relief reports that 10 of 42 locations showed improvement in some lines of business over the past week; generally, little change is reported from week to week. Fed. Reserve Sept. Bulletin stresses strong position of Fed. Reserve system, notes gold held by Reserve banks is now $2B in excess of the requirement of 40% against notes and 35% against deposits; this is about $400M larger than two years ago. US monetary gold stock reached $5B in early Sept., the highest in history. Reserve bank holdings of govt. securities at end of Aug. were $728M, close to a record. Report by the experts committee in Basel puts total German foreign debt at 25.5B marks in Dec., vs. 23B in July. Agriculture Dept. reports official estimates for wheat production in 31 countries for 1931 totals 2.720B bushels, down from 2.861B in 1930. However, prices worldwide have continued to be depressed by large carryovers from last year, by large crops in countries with early harvests, and by heavy Russian shipments. Texas Gov. Sterling signed cotton acreage reduction bill, asked Governors of nine other cotton states to enact similar laws; opponents expected to challenge Constitutionality of the law. The ICC heard arguments against the proposed 15% rail freight rate increase from Sen. Brookhart (R., Ia. ), representing farmers, and from shipping, coal and lumber interests. Cicero R. Murray, “generalissimo of military forces enforcing the shutdown of Oklahoma oil fields,” denied reports Gov. Murray had agreed to reopen the fields Wednesday, but said an effort was being made to reach a solution to the shutdown. Gov. Murray had previously threatened to keep wells closed until oil reached $1 a barrel. Texas Railroad Commission's order cutting allowable production per East Texas oil well to 185 barrels/day from 225 has had a beneficial effect, reducing total East Texas production to 366,000 barrels/day from 425,000. However, spot gasoline in the Chicago market was lower as reports of possible reopening of Oklahoma production "is causing some disquietude." US electric output for week ended Sept. 19 was 1,663 GWHr, down 3.4% from 1930. US shoe output in Aug. was about 31.3M pairs, up over 9% from 1930; first 8 months 219.1M, up 3.8%. Announcement by Transamerica Corp. that it intends to divest its bank affiliates has created considerable local speculation on the fate of Bank of America, N.A. ; there have been reports from time to time that this bank might be merged with a local (NY) one. An old Court of Claims decision is seen as a bar to plan of M. Steuer for $30M lawsuit by Bank of US depositors against NY State. Companies reporting decent earnings: Southern Calif. Edison, Perfect Circle (automotive piston rings). The railroad examiner was giving a candidate for engine driver his final examination. "You're driving an engine down a steep hill and your speed becomes excessive. What do you do?" "Apply the brakes." "They aren't effective." "Put brake handle into emergency position." "Doesn't slow you down enough." "Reverse the engine and turn on steam." "The wheels fail to grip the metals." "Pour sand on metals." "Sand is damp and won't pass through the pipes. Now what do you do?" "Why, let her rip. We must be back on the straightaway by now." 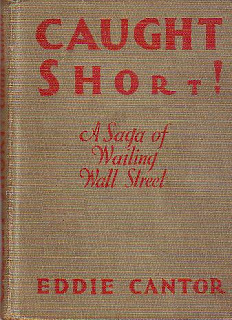 After writing my recent note on Eddie Cantor, I did a search on Amazon and was delighted to find that “Caught Short: A Saga of Wailing Wall Street,” a book by Cantor about the Crash, was available. Ten bucks and a week or so later, I was holding said book in my hot little hands - see pics to the right (note to those considering purchase of the book - it does contain some offensive humor). But seriously, the crash has had some terrible consequences. Here's a few detailed statistics we gathered afterward. - 150,207,904 new nickels are being produced by the US Mint in 24 hour shifts - for customers who never took the subway before. - 48,286 nightclubs throughout the country are now catering nightly to 263,679 people - unfortunately, all of them are employees. - 87,429 married men in New York City had to leave their sweethearts ... and go back to their wives. 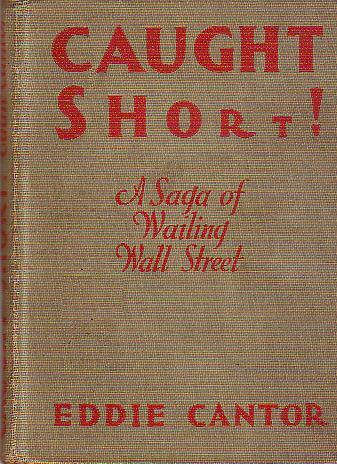 And, another humorous bonus - from time to time the Journal published little poems about the stock market. For some reason, I can't get enough of these ... so here's a little collection for your reading pleasure. when Purity touched fifty-five - down forty-four, O Man Alive! I wriggled like a frightened eel from out the avalanche of Steel. but hand and foot are many put 'in stocks' for long duration. ... A thousand dollars send by check, your margin with us to protect. With faith in Steel I held the stock; more margin sent from cash in sock. A 10 point loss I took in Steel, again to try the gambling wheel. The fool I was! I stayed and played; Put up more cash - more tips I played. Without a penny to my name, I'm off for life that market game." I am the master of my 'Roll'; I am the captain of my 'Wad.'" Now isn't it a funny thing That tips are all bologney? I started once with that 'shoe string' To swell my patrimony. I rushed right in and bought it high; That's what they told me later. Good news came out my stock rose --- hell! To you it doesn't matter. Why doesn't some one really know One in which the cat will jump? A man should really buy 'em now, if he'd a fortune reap. And then they all have further dips to fret a mind distraught. As if I were, perhaps, J.P., or Henry Ford, or Schwab. While men cried 'Buy, you dumb bozo,' but failed to say what with."